Old Mesilla is about an hour and a half drive from El Paso, a lovely, pleasant, very old and quaint town with lots to see and do and many choices for dining. You'll enjoy the unique shops, museums and art galleries. We'll kick back, relax and enjoy ourselves on the bus drive, renewing old acquaintances -- there will be snacks, soft drinks and bottled water, and some of you might want to pack along beer or other adult beverages. Mesilla is a small town by today's standards but 150 years ago it was the major hub for travelers between San Antonio and San Diego. Mesilla hasn't changed much over the years, allowing visitors to see what an 1800’s border town really looked like. Billy the Kid once stood trial for murder in a Mesilla courtroom, and the Mesilla Plaza was once an important stop for the Butterfield Stagecoach. Originally, Mesilla was part of Mexico, but with the signing of the Gadsden Purchase in 1854, the village became part of the United States. 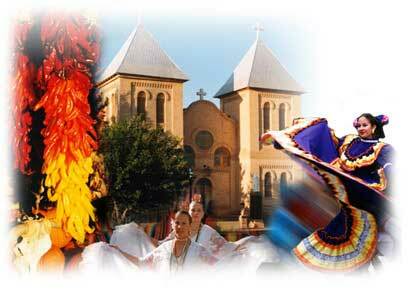 Today, Mesilla offers a wide range of historical and cultural events, shopping, and dining in the town's plaza. Enjoy a meal at the famous Double Eagle or La Posta restaurants or there are many other delicious choices to experience a wide variety of cuisine while visiting one of the most historical locations in New Mexico. In the sixteenth century nomadic Indians, such as the Mansos, occupied the Mesilla Valley. Indian Pueblos were located to the north and west. Apaches and other tribes regularly passed through the area and camped in Mesilla. In 1540, Coronado traveled through New Mexico and since he didn't find the cities of gold and jewels he'd expected, little interest was shown in the state for the next 40 years. Juan de Onate led others to New Mexico in 1598, following the Rio Grande river from El Paso north, to conquer the Pueblos and explore for gold and silver. 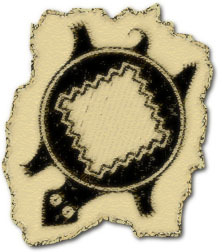 Onate's route became a link between the Spanish settlements of El Paso and Santa Fe and became known as El Camino Real, or the Chihuahua-Santa Fe Trail. Onate sojourned in the area of what is now Mesilla on his journey north, but no settlement was established there for 200 more years. After being conquered by the Spaniards and living for years under Spanish rule, the Pueblo Indians revolted in 1692, but Diego de Vargas, traveling north on El Camino Real, organized a successful defeat, and New Mexico remained under Spanish rule until 1821, the year Mexico achieved her independence from Spain. Trading flourished along the Chihuahua-Santa Fe Trail, and the Rio Grande Valley became both a politically and commercially valuable territory. 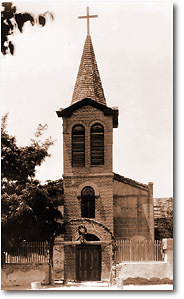 Following the Civil War, Mesilla resumed its role as the commercial and transportation center for the region. It equipped the profitable mining activities and ranching operations that had become important industries in the territory. An ever greater number of passengers and freighters helped the town become a vital link in the important (and dangerous) transportation network of the Old West. 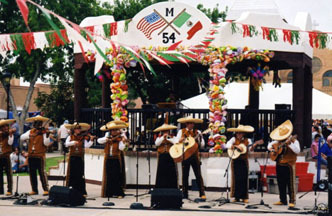 Mesilla had become a lively social center by the 1880s. 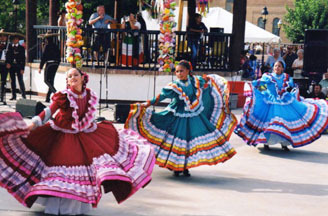 People came from as far as the cities of Chihuahua and Tucson to attend bailes (dances), bullfights, cockfights and theatrical presentations. As a social center, the town also attracted more than its share of violence, and it wasn't uncommon to see differences settled in the streets with guns. 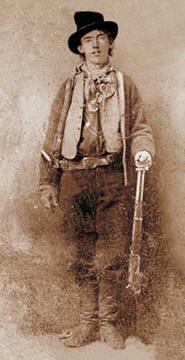 Outlaws such as Dutch Hubert, Nicolas Provencio and Billy the Kid frequented many of the bars and activities in town. In fact, it was at the jail and courthouse on the southeast corner of the plaza that Billy the Kid was tried and sentenced to hang in 1881. The town of Mesilla was as wild as the West ever was. In 1881, the railroad bypassed Mesilla in favor of Las Cruces, four miles to the northeast. With this event, the county seat was moved to Las Cruces and Mesilla's importance was soon dimmed by its neighbor. As a result, Mesilla has experienced little growth until recently, and so has retained much of its original nineteenth-century character. The 1950s and 1960s saw new building growth in more modern styles, but citizens of Mesilla, wanting to retain the character of the original town, enacted a historic zoning ordinance to promote the preservation of the lovely old settlement. 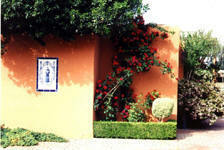 Because of this foresight, Mesilla retains the physical proportions, scale and ambiance that it had a hundred years ago. Stabilization, restoration and rehabilitation projects undertaken by individual property owners and businesses have, for the most part, retained the architectural character of the structures. 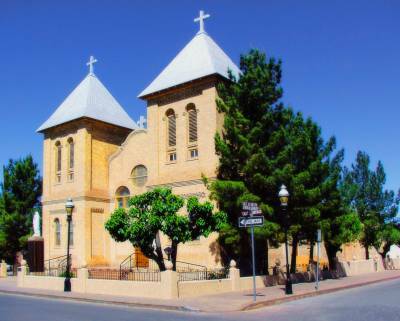 The Mesilla Valley offers an extensive array of art, there are galleries, museums, studios, public and fine art, sculptures, paintings, photographs and historical artifacts. Within the friendly streets of historic Old Mesilla, local museums, galleries, and alternative art venues provide visitors the chance to not only observe the talents of our many fine local artists but also to learn about Old Mesilla's history, culture, and diversity of people. The Mesilla Valley Mall, with the largest selection of stores in southern New Mexico, is also home to the historic Mesilla plaza and the Mesilla Mercado, which features small traditional and contemporary shops and boutiques specializing in southwestern art, fashion and crafts. Every Wednesday and Saturday morning in the downtown mall, the Las Cruces Farmers & Craft Market showcases local handmade crafts, photography, jewelry, fresh produce and more.